Skerrols House is a 7 Room Luxury Guest House located close to Bridgend, right in the heart of Islay surrounded by breathtaking countryside, offering bed and breakfast run in the best Islay tradition. All our rooms are finished to the highest standard and every guest comfort has been taken into consideration from the finest bed linen to free wifi, satellite TV and all the many other conveniences you would expect as standard from a luxury Guest House. We are ideally positioned to visit all 8 Whisky Distilleries on Islay and would be delighted to arrange tours on your behalf so that you can enjoy a dram or two of your favourite whisky or just soak up the fascinating history of the whisky industry on Islay. If nature is your passion then you will be spoiled for choice, Islay is teaming with wildlife, the finest fishing, red deer, birds of prey, grey seals and even the odd minke whale. 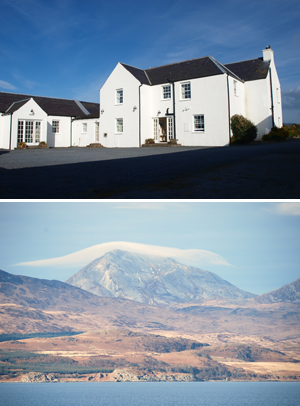 Whatever your reason for visiting Islay, Skerrols House will ensure your every comfort during your stay and make your trip one to remember.